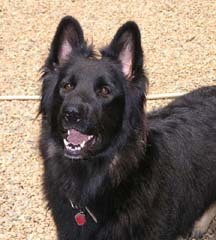 Chica is our gorgeous bi-black/cream Shiloh out of our own Boo Boo and Indy. She has a lovely, sweet temperament, solid bone and an easy, flowing gait. 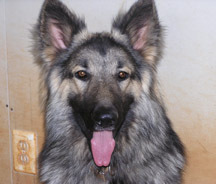 Her PennHIP score is in the 100th percentile compared to other Shiloh Shepherds. She weighs a solid 95 lbs and is 27 inches at the whither. Gator is our Handsome boy from Miracle Shilohs in Canada. This was an outstanding breeding and Jan picked Gator out specifically for the calm, solid temperament we asked for. Gator enjoys working with children who have severe mental and behavioral problems. I can take him anywhere at any time and expect consistency in his disposition and behavior. His last litter, when bred with our Dolly (Boo Boo's sister), produced beautiful babies with temperaments just like his own. This breeding is the third generation born here at our home and we're very excited about it. We expect happy, laid back puppies with great health and outstanding temperaments.